Why is John Lewis, whose own partner, VP Matt Holder, is an alternate on the OC GOP central committee supporting, endorsing, and working for a Democrat? It isn’t as if this was some up and coming blue-dog Dem that has has chance of converting to the red side either. This is the notorious Tom Daly whom FFFF has been reporting on for several months as perhaps the most egregious and dubious waster of public funds that OC tax-payers have seen in a long time, maybe ever! Clearly John Lewis isn’t doing it because he believes his own rhetoric…or does he? 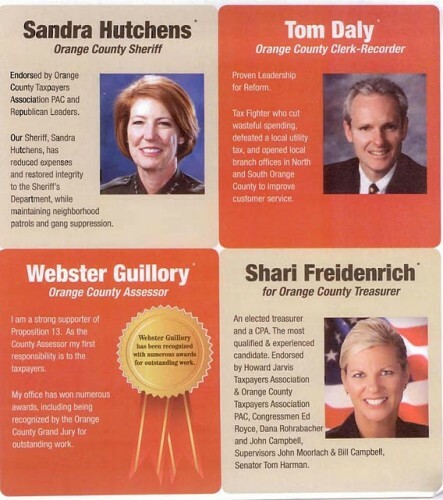 This mailer/advertisement says Daly is a “tax fighter has cut wasteful spending…” I suppose John Lewis has missed the news: Tom Daly has cost OC taxpayers millions upon millions of dollars of needless spending for the sole purpose of satisfying donors, their friends, and their families.